The Classical Institute of the South (CIS) at The Historic New Orleans Collection is dedicated to gathering and sharing information about the history of the Gulf South’s rich material culture. CIS field survey work catalogs historic objects with provenance in Louisiana, Mississippi, or Alabama dating from the eighteenth century to 1865. These objects shed light on daily life in the past as well as the region’s enormous economic expansion in the early nineteenth century. Gulf South residents were far from isolated, using the Mississippi River to trade with northern cities and even Europe. CIS was founded in 2011 by New Orleans attorney Paul Haygood. The Historic New Orleans Collection incorporated the Classical Institute of the South into its mission in 2016, establishing the Paul M. Haygood Fund to honor the memory of CIS’s founder and to enable future field survey work. ClS’s Gulf South Decorative & Fine Arts Database is hosted by the Louisiana Digital Library and is managed by THNOC staff. This free public resource offers images and descriptions of thousands of historic decorative arts objects, many of them in private collections, documented by CIS teams. The goal of the database is to encourage further appreciation and exploration of the Gulf South’s significance to decorative arts and material culture history. Since the inaugural field survey in 2011, CIS teams have recorded thousands of important pre–Civil War objects in dozens of residences, churches, and museums. Past field surveys have included sites in New Orleans and St. Francisville, Louisiana; Natchez, Port Gibson, Woodville, and Columbus, Mississippi; and Camden, Demopolis, and Huntsville, Alabama. Braving summer heat and humidity, the intrepid CIS explorers have discovered rare treasures and made lasting connections with local residents who embody the best of southern hospitality. With questions about CIS or to suggest a potential CIS field survey site, contact CIS coordinator and research curator Sarah Duggan. CIS has received coverage in national and regional media such as The Magazine Antiques, The New York Times, AL.com, The Baton Rouge Advocate, The Columbus Dispatch, The Natchez Democrat, and The Historic New Orleans Collection Quarterly. Former CIS fellows have presented research inspired by their Gulf South field work at the Natchez Antiques Forum, the Newport Symposium, and the Decorative Arts Trust Forum. CIS is assisted by an Advisory Board that includes colleagues at the Decorative Arts Trust, the Museum of Early Southern Decorative Arts, the Decorative Arts Trust, and the Winterthur Program in American Culture. Matthew A. Thurlow, Executive Director of the Decorative Arts Trust, serves as Advisory Board Chairman. CIS offers two annual summer fellowships for graduate students of history, material culture, and art history. 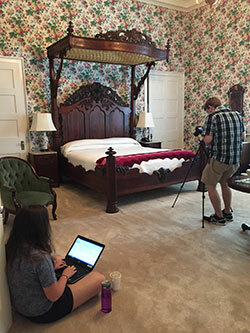 For five weeks, fellows travel around the Gulf South with the CIS coordinator/research curator, documenting historic decorative arts. The 2019 summer field survey plans to continue previous documentation work in Natchez, MS and begin new projects in Alabama. Survey objects are typically in private collections, often in situ in historic homes. The field team documents a wide range of decorative arts; including furniture, ceramics, textiles, paintings, and silver. Schedule: Upcoming fellowships will take place June 25 – August 4, 2019. After several days of orientation at THNOC, fellows will travel to survey sites with the CIS Coordinator/Research Curator. Fieldwork usually takes place 9am to 5pm Monday through Friday, although some weekend or evening work may be necessary depending on site availability. Applicants must be able to travel and work in the field for extended periods of time, and be flexible and responsive to evolving work conditions and climates. Benefits: $2,000 stipend paid upon completion of fellowship; plus housing, on-site transportation, and reimbursement for travel expenses to and from New Orleans. Fellows also receive a scholarship to THNOC’s New Orleans Antiques Forum, which concludes field survey activities. knowledge of pre-1860 American decorative arts and best practices of artifact care and handling. enthusiasm for exploring new historic sites and discussing local history with the public. ability to collaborate with teammates as well as work well independently. ability to develop relationships and to provide excellent customer service to donors, owners, collectors, the public and representatives from other cultural organizations. exceptional attention to detail and ability to meet deadlines. Applications: Applications for 2019 fellowships are due March 19, 2019. To apply: Submit a current CV, contact information for two references, and a cover letter explaining your interest in CIS efforts and how prior experience has prepared you for field work. Send applications to jobs@hnoc.org.